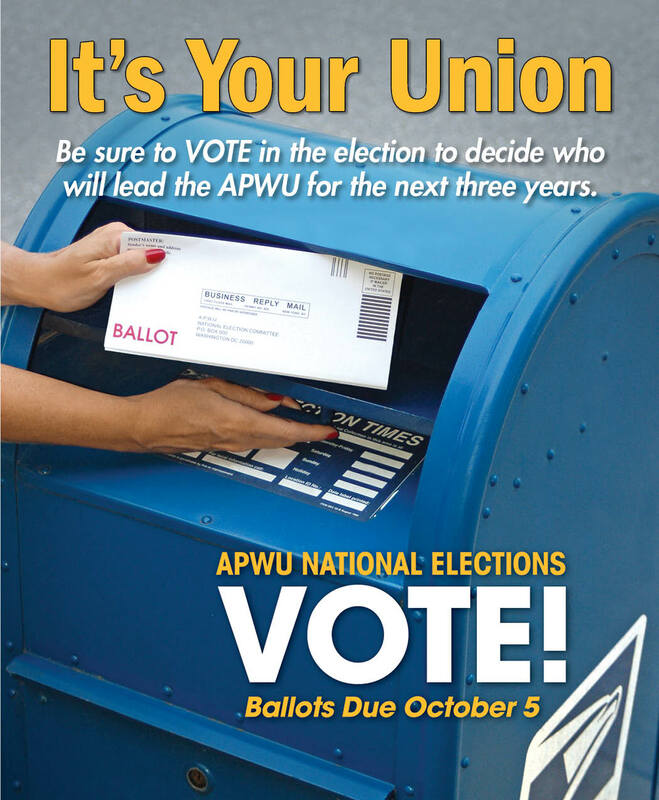 Ballots for the 2016 Election of APWU National Officers will be mailed to members’ homes Saturday, Sept. 10, to Thursday, Sept. 15. All members “in good standing” as of June 24, 2016, will receive a ballot. To be counted, ballots must be returned to and received in the designated post office box in Washington, DC, by 2 p.m. on Wednesday, Oct. 5. Union members are encouraged to follow the balloting instructions carefully. Members in good standing who have not received their ballots by Monday, Sept. 19, should notify their local or contact the American Arbitration Association between the hours of 9 a.m. and 5 p.m. (Eastern Time) at 800-529-5218 to request a duplicate. Ballots may also be requested by visitingwww.aaaelections.org/apwu. All requests for duplicate ballots must include the member’s name, address, employee ID number (or retiree ID number), the last four digits of the Social Security number, division (craft), and local. The APWU National Election Committee will take custody of the ballots from the designated post office box at 2 p.m. on Wednesday, Oct. 5. Votes will be tallied at the Kellogg Conference Center at Gallaudet University, 800 Florida Avenue NE, Washington DC 20002. Unofficial election results will be posted on the union’s website, www.apwu.org, as soon as they are available, and will be updated frequently. Official results will be posted as soon as they are available as well. For more information, visit apwu.org. ← Was UPS behind that “huge security gap” story?